Open Innovation is the art of creating value through collaboration, by building meaningful links between people who might otherwise never meet. It is more than just an act of translation, of helping people to speak the language of those they want to work with. It’s a whole package of activities that build and manage networks, and catalyse new ways of working. For Open Innovation Teams like the one located in Cabinet Office, this work requires a deep understanding of some very different worlds, and the ability to develop high-trust relationships in all of them. 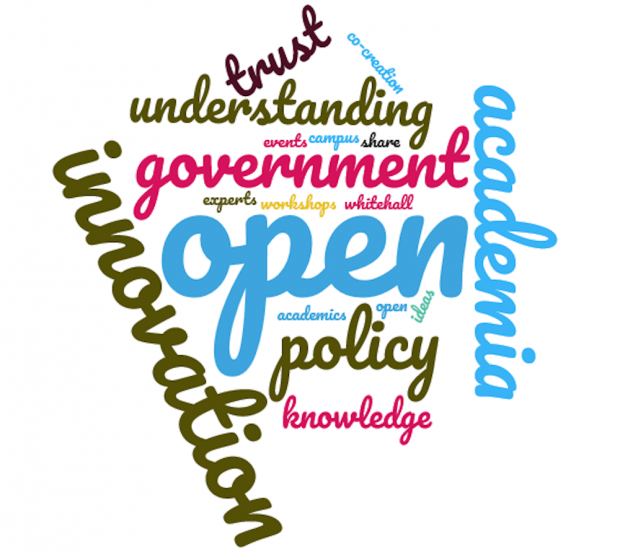 These twin tenets – understanding and trust – are what underpins the remarkable success of the Open Innovation Team in its relatively short life. The understanding comes from wide-ranging experience across government, combined with a deliberate effort to connect with leading thinkers in university campuses across the UK. In each case, the relationships being built, whether in government or academia, are richer and more purposeful than simplistic networking. The team needs to know how people work, what they value, what challenges they currently face, and how different activities in their portfolio might support them. This depth of understanding is what makes the OI Team an impressive choreographer, with a flair for creating new, shared opportunities. But a choreographer is no good without the power to convene. This is where trust plays an essential role in open innovation. When you are talking ideas into reality, which is what the OI team does so well, trust allows other people to take a chance, to come to events or meetings, knowing that something interesting might happen. Trust allows you to create safe spaces for encounters that would never normally happen. Trust allows academics to share their ideas – perhaps the product of decades of research – connecting to government agendas and so generating value for society that might otherwise have stayed hidden. Having researched OI in pharma, banking, healthcare, charities and telecoms, one common thread is an ambition to go beyond short-term project wins. The long term value of these organisational experiments lies in their ability to change cultures, while developing capabilities across all stakeholders. As academics develop the skills and appetite to work more effectively with policy makers, and vice-versa, the scale and scope of these encounters can expand. It’s an ambitious goal, but one worth pursuing if we want to get the most out of our leading universities, in the pursuit of innovative policy-making. Thanks Chris - good blog. Definitely agree that it goes beyond language to issues like 'clock-speed' of different types of organisation, and sharply dividing success and failure criteria.